FORMost Equipment Sales offers practical solutions for your company’s paper processing demands, regardless of your business’s size. Whether you are looking to streamline your mailings process or replace aging equipment currently in your office, our staff can help guide you through your options. 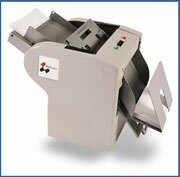 We offer an extensive selection of inserters and pressure seal folder-sealers to meet your needs! What Are Pressure Seal Mailers? A Pressure Seal self-mailer is designed to be laser printed, folded, sealed, and mailed in much less time than conventional printing and mailing processed using envelopes. It’s a one-piece sheet that when folded, becomes the envelope. That means no more envelopes to inventory and insert – which helps reduce labor and supply costs! There are six fold styles of Pressure Seal Mailers to give you virtually unlimited options for the various applications of your business. C fold, Z fold, V Fold, EZ fold, ZX fold. They are available in 8-1/2 x 11, 8-1/2 x 14, postcard sizes, and built in reply envelopes. 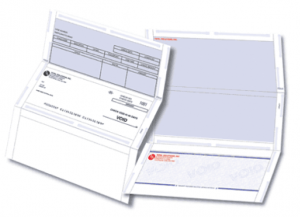 Whether you use Pressure Seal Mailers for payroll, accounts payable, business checks, direct mail, notices, report cards or one of the many other applications, you’ll see a difference almost immediately in cost savings, greater productivity, and more versatile document capabilities. You will soon discover why it pays to use PS Mailers pressure seal self-mailers to cut costs and streamline everyday business tasks. Pressure seal is a self-mailing system designed to be used with laser cut sheets, continuous forms, and custom business forms. You can run the pressure seal forms through your printer as usual, fold and seal them using your Pressure Seal equipment, and then put them right in the mail. 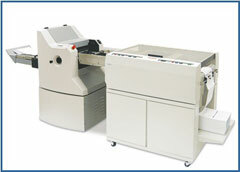 FORMost carries machines designed for both office environments and large-scale production facilities. FORMost Equipment Sales can align your business with the right pressure seal equipment and forms to get your job done quickly and easily. Whether you want to automate your regular mailings or launch a new direct mail campaign, you will be able to choose from an extensive selection of self-mailer pressure seal folder-sealers. Our forms are available in numerous formats and styles, and we can also make custom designs to match your exact specifications. 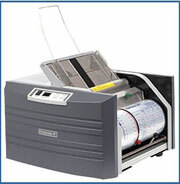 The PSM1800 makes pressure seal a viable options for the smallest of offices. Organizations processing as few as 6,500 documents per year can cost justify the PSM1800. 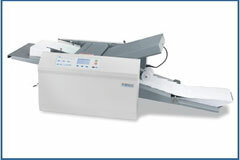 The PSM3000 is an integrated folder/sealer with a processing throughput of 3,000 documents per hour. This affordable desktop solution is a good fit for the small office looking to streamline their document processing. The PSM5000 delivers unparalleled value to the pressure seal market. This value-added folder/sealer includes an integrated conveyor and digital counter – at no additional cost! The duty cycle is perfect for the office that is small today but will be large tomorrow! 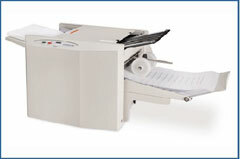 Print, fold, and seal all in one step with the new PSM IN-LINE 6400-4. This streamlined system brings a superb cost-to-value ratio and delivers up to 65 mail-ready pieces per minute. The ease of use makes the PSM7000 attractive to mid-sized organizations of all kinds. 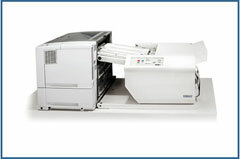 An impressive 7,000 sheets an hour will satisfy even the tightest of deadlines. Offering an extended 36″ conveyor, the PSM10K Plus is ideal for organizations with high-volume output requirements. 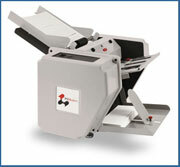 The PSM6500 stand-alone folder/sealer system is ideal for small to midrange users. It folds and seals all popular fold styles eliminating folding, stuffing and sealing, all with no add-on parts or additional charges. 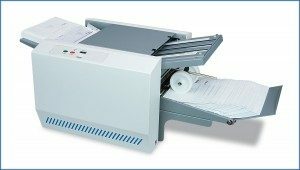 The PSM6500 can also be used as a folder to quickly prepare promotional materials or other office correspondence requiring a standard or windowed envelope. The PS30 is a user-friendly and simple to operate desktop Pressure Seal machine. The slide-out fold unit design is unique and affords easy access and maintenance. 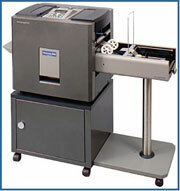 The PS30’s manual feeder option allows single form processing. The PS 30 is ideal for a small to mid-volume user. The PS100 folder sealer offers quality and robust construction not found in small to medium volume machines which are in its class. It uses two pairs of large diameter solid steel sealing rollers which are the core of any high quality pressure seal machine. The PS100 uses the same design and construction in its sealing section as its higher volume cousins the PS400, PS600 and PS800. Fitting easily into any office environment the PS100 will work with your existing impact or laser printer. It folds and seals your forms at a comfortable 6,500 forms per hour which fits well with the workflow of processing medium volumes of pressure seal forms. Paper flow is electronically monitored and the system will automatically shut down in the event of interruption; you can immediately begin operations without disrupting document sequence or count. In addition, an out feed counter is a standard feature, to allow easy calculation of processed documents. The PS100 is a no compromise design at a very competitive price. The old saying “you get what you paid for” was never more true. The PS300f is a robust machine built for steady running. Two pairs of solid steel rollers with 1/4″ steel side frames ensure a securely sealed pressure seal form. The PS100 and the PS300 are similar in design with the difference being a larger drivetrain and heavier construction to deal with a higher speed and volume rating. The PS300 is a tabletop machine with large in-feed hopper delivering sealed forms to an automatic shingle delivery conveyor. All fold styles are accommodated. An optional vertical stacking out-feed conveyor is available. The PS300 is a highly reliable pressure seal folder sealer with a proven track record. It’s robust construction will prove its reliability year after year. If you are interested in purchasing a reliable machine with high quality and durable construction without a lot of unnecessary electronic features then consider the PS300f. The PS 350 is an advanced heavy duty Desktop Pressure Sealer with performance features to fit the needs of nearly all mid-range requirements. For even larger volume needs the PS 350 is also offered in an “HD” version. 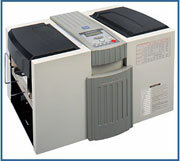 In addition the PS 350 is available as an InLine configuration. The PS500 is an enhanced version of the PS350. An infeed capacity of up to 1,500 sheets along with a processing speed of 13,000 sheets per hour mean the PS 500 is unmatched in performance for a machine at this price level. It includes all the features that any high volume solution should offer such as uninterrupted document infeed loading, variable speed and higher capacity outfeed options. The PS500 also offers attractive design when paired with its matching cabinet. 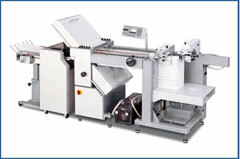 The PS600 folder/sealer is the ultimate machine for the medium to large volume processing of one-piece mailers. It has commercial duty construction with solid steel side-frames and two pairs of large diameter solid steel sealing rollers. For medium to long run mail processing there is no better solution. It is a proven performer in mail rooms and mail shops all over the United States. Its commercial duty construction along with high performance features such as a bottom fed vacuum infeed table ensure unbeaten reliability and performance. Mail room employees familiar with folding machines will appreciate the commercial duty construction. The PS600 can be configured with a slitter on the outfeed end to enable double wide processing of narrow forms such as double postcards. For even higher volume processing of cut sheet pressure seal forms we recommend installation of two PS600 units for reliability and efficiency. The PS800 is the world’s fastest pressure sealer and has the capability of processing up to 40,000 single width, auto-fold, cut sheet documents per hour. The PS800 system utilizes “state of the art” precision folding technology, combined with automatic process controls, and is ideal for large capacity users. The PS800 is capable of a high forms handling capacity, from a deep pile feeder mechanism, or alternatively from an air feeder system, ensuring that 4,000 forms can be loaded and processed in one operation. It can also be incorporated in jumbo roll fed pressure seal installations and in fact is currently supporting dozens of super high volume pressure seal installations nationwide. The PS800 is available in stand-alone cut sheet configuration or it can be configured with various high volume infeed systems in addition to working with a jumbo roll fed system. The FD1200 AutoSeal offers a user-friendly low-volume solution for processing one-piece pressure-sensitive mailers. Combined with a laser printer and pressure seal forms, the FD 1200 creates secure, mail-ready pieces. The FD 1400 AutoSeal offers a user-friendly low-volume solution for processing one-piece pressure sensitive mailers. The clearly marked fold plates, control panel, and drop-in feed system provide easy set-up and operation, right out of the box. These features, combined with a sleek desktop design, make the FD 1400 ideal for processing documents in an office environment with low volume applications. With a speed of up to 60 forms per minute and the added capability of processing 14″ forms, the FD 1400 enables operators to complete daily processing jobs with ease. The FD 1500Plus AutoSeal is an ideal low-volume pressure seal solution for processing one-piece pressure sensitive mailers. Built with proven Formax technology, the FD 1500Plus provides an economical solution with the quality and reliability you have come to expect from Formax. The integrated output conveyor keeps forms in a neat, sequential order. Clearly marked fold plates and drop-in feed system provide easy set-up and operation, right out of the box. The sleek office design and ease of operation make this unit ideal for processing documents in an office environment with low volume applications. A processing speed of up to 5,200 forms per hour enables operators to complete daily jobs in minutes. The added capability of processing 14″ forms gives the FD 1500Plus the versatility needed to fold and seal virtually any low volume application to meet your needs. 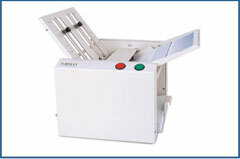 The FD 2002 is also available as a package, the P2002, which includes a fully enclosed cabinet for storage and an 18″ conveyor with photo eye for neat and sequential stacking of processed forms. The cabinet and conveyor are options for the FD 2002. The AutoSeal FD 2000IL System interfaces the industry-leading FD 2000 AutoSeal with model-specific MICR and non-MICR desktop laser printers (not included) to provide enhanced document security. The FD 2054 advanced software allows for all standard fold types and paper sizes to be customized to meet your particular needs. Options include a fully enclosed cabinet for storage and 402 Series Joggers to reduce static electricity and align forms for proper feeding. These features combine to make the FD 2054 an ideal solution for streamlining your post processing. The AutoSeal FD 2052IL System interfaces the industry-leading fully-automatic FD 2052 AutoSeal with model-specific MICR and non-MICR desktop laser printers to provide enhanced document security. The FD 2084 is a combination of the FD 2094 and the Formax FD 676 Maxi Burster. This configuration is capable of separating, folding, and sealing continuous pressure seal forms in-line. Six fold types are pre-programmed with the ability to store up to three custom folds into memory, plus it has the flexibility to process forms up to 20″ in length. Fold plates and conveyor stacker wheels are set at the touch of a button, providing efficiency and ease of use. The high-capacity 31″ output stacker is a standard feature and offers neat, sequential stacking of forms. An optional center slitter and two-up form kit is available for applications such as double postcards. The FD 2094 has a remarkably small footprint, is fully-automated and uses a bottom air-feed system for continual loading of cut-sheet forms. Six fold types are pre-programmed with the ability to store up to three custom folds into memory, plus it has the flexibility to process forms up to 20″ in length. Fold plates and conveyor stacker wheels are set at the touch of a button, providing efficiency and ease of use. The high-capacity 31″ output stacker is a standard feature and offers neat, sequential stacking of forms. An optional center slitter and two-up form kit is available for applications such as double postcards. The AutoSeal 2200 Series High Volume Pressure Sealers are designed to handle the highest volume jobs with ease and dependability. The 2200 Series offers fully automated settings to provide for quick and easy setup of different jobs. 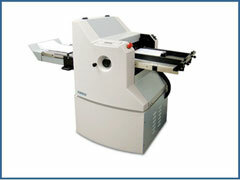 Processing speeds of up to 40,000 forms per hour sets the industry standard for speed and production capabilities. 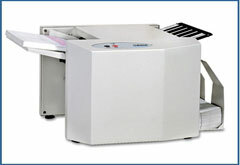 Four models are available in the 2200 Series which offer different in-feed options, three models for cut-sheet forms, and one for continuous forms. The FD 2200 utilizes an air-feed system with a capacity of up to 500 forms; the FD 2200-EX offers an extended air-feed system to reach a capacity of up to 1,000 forms; the FD 2250 utilizes a pile feed system to reach a total capacity of up to 3,500 loaded forms; and the FD 2280 works in-line with the Formax FD 676 Maxi Burster to process continuous forms. The AutoSeal FD 2200-10 Stand-Alone pressure sealer is the ideal solution for high-volume mailers who want to utilize existing floor model folding systems. The ability to purchase a “sealer-only” system versus a complete folding and sealing solution drastically reduces the up-front cost of adding pressure seal capability.